Cooler temperatures and additional rain in the area helped to keep drought at bay for a second week. 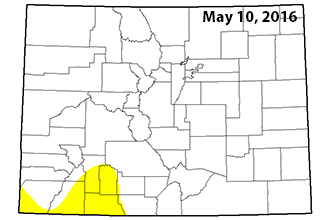 The southeast corner of the state escaped remaining abnormally dry conditions in Baca, Prowers, Bent and Las Animas Counties last week as a round of wetter weather soaked an area that had crept into moderate drought earlier in the year. Only a small portion of Colorado remains in the the abnormally dry category - the lowest level of drought. 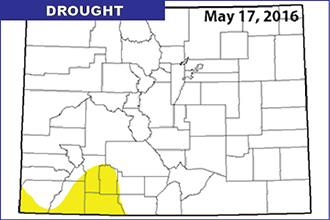 Montezuma, La Plata, Archuleta, Conejos, Rio Grande, Mineral, Hinsdale and San Juan Counties are currently impacted by abnormally dry conditions. One year ago, nearly 57 percent of the state was under abnormally dry to severe drought conditions. The situation may start to change over the coming week as temperatures reach the low to mid-80s starting Saturday, and chances of rain are almost entirely absent through the middle of the week.